This product is no longer available and has been replaced by: EE181. Some accessories, replacement parts, or services may still be available. 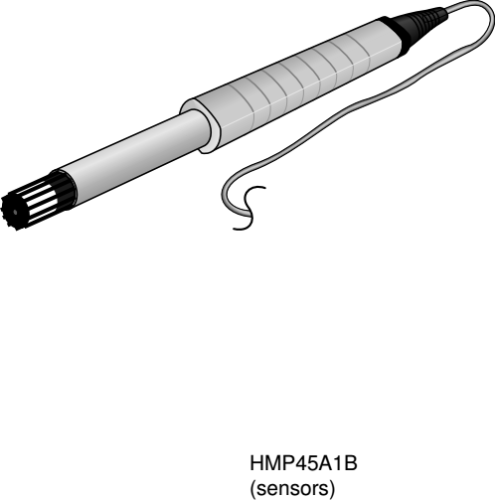 The HMP45C-LQ is a rugged, accurate temperature and relative humidity probe. The sensor measures relative humidity over the 0 to 100% RH range and temperature over the -40° to +60°C range. For this version of the HMP45C, the cable terminates in a military style connector and has a user-specified lead length. The connector attaches to the RAWS-P enclosure, which mounts to a CM6/CM10 tripod, CM110-series tripod, or UT-series tower. The probe uses a HUMICAP capacitive polymer H chip to measure relative humidity over the 0 to 100% RH range. A PRT measures temperature over the -40° to +60°C range. The sensor cable terminates in a military style connector and a user-specified lead length. The connector attaches to the RAWS-P enclosure. The HMP45C-LQ should be housed in a 41003-5 10-plate naturally-aspirated solar radiation shield. This radiation shield mounts to a tripod or tower mast, crossarm, or user-supplied pole.